An intoxicating and heady mixture that is ready for dinner in less than 30 minutes! I stood over the pan of sputtering shrimp and watched as they turned from sea gray to sunset pink. They were coated with a garlicky onion mix tinged green from the fresh cilantro and dill. A pungent Middle Eastern aroma sprung up from the pan when I added the Kuwaiti spice mix that I recently put together. I left the shrimp momentarily to throw the caramelized onions that I had cooked down with cinnamon, raisins, and toasted almonds into the baked acorn squash, and tossed in a bit of parsley. I was back to the shrimp for a quick stir and the over to fluff the couscous when the phone rang. It was a good friend and fellow principal calling to check in after a long day at her school. I had beat her home and she was jealous that I was already into dinner. “So, what are you making tonight?” she inquired with a note of expectation as she had come to enjoy our meals, albeit vicariously. “So what’s the occasion?” she asked a bit incredulously. “Wow, you are crazy!” but she knew it was more than psychosis, “Do you find that cooking relaxes you after a hard day at school?” she asked. “I do,” I hesitated and then pondered a moment. “So much of what we do is a long process. 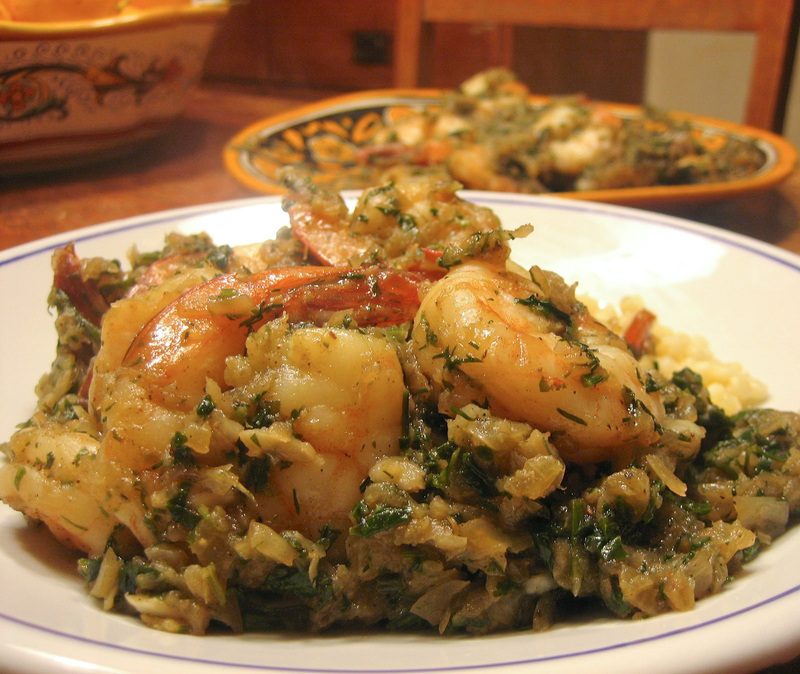 We have our students for six years and they are still a work in progress when they leave us, but cooking is immediate gratification,” I said as I admired the shrimp that were just about ready. Soon we hung up and I was again left alone with the shrimp and my thoughts as I contemplated what it was I really loved about cooking at the end of a long day. A wave of nostalgia for my future swept over me as I realized that this kind of cooking was really about Andrew. Already a quarter of the way into his junior year, it hit me that in less than two years I would be cooking for one again. This great joy of mine has an expiration date in the not too near future. I know that this could be cause for a bit of depression, but the truth is that an expiration date is a stark reminder to fully embrace the now, and to love and cherish every bit and scrap of opportunity until that time comes. Too often we delude ourselves into believing that life is endless and make decisions to put off living it to the fullest for an undisclosed date in the future. But everything in life has an expiration date, and Andrew will one day move on. So Monday night’s meal extravaganza follows Sunday’s spectacular supper and precedes Tuesday’s down-home comfort food. Wednesday is rushed because of clarinet, but we make up for it with Sushi Thursday, which we have celebrated for almost four years now with homemade sushi rolls. Friday is light and Saturday is homemade bread with butter and jam. It’s a rhythm and balance that is comforting like hot biscuits on a cold Sunday morning. There have been times in my life where I have kept a special, rare, or costly ingredient guarded for so long, worrying that I might not ever get it or afford it again, that it has gone bad before I even used a fraction of it. I only have a year and a half left with my son living at home, but I plan to lick the beaters clean and scrape every last bit of cookie dough out of the bowl of life with which I have been blessed. This is an amazing recipe from one of my favorite cookbooks. In fact, we make this so often that Andrew thinks it’s one of “our” family recipes. For now I’m going to let him continue to think that his dad is a genius in the kitchen. He can learn my secrets someday in the future when he goes to the blog for this recipe. This is a very easy weeknight meal, but you have to take the time to make the spice mix in advance. The recipe for the spice mix will last in a sealed jar for more than a year, so you only have to do this once in a while. Serve with basmati or jasmine rice. This is an easy recipe to cut in half if you are making dinner for only two. Heat the olive oil in a large skillet over low heat and add the onions. Don’t let them overlap too much, so you will have to use a pretty big skillet. Cook, stirring frequently, until they release their juices and are tender, about 10 minutes or so. Add everything but the shrimp. Stir until the onions are coated. Raise the heat to high, add the shrimp, and cook, stirring, until the shrimp turn the color of a Mediterranean sunset, about 8 to 10 minutes. 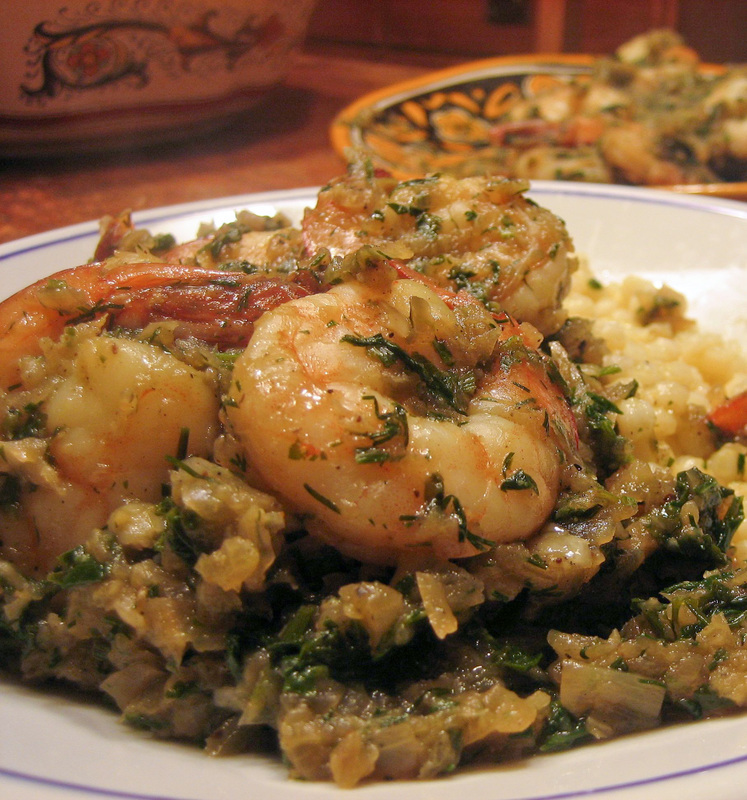 Transfer the shrimp and onions to a serving platter, and garnish with the lemon wedges and cilantro sprigs. Combine all the spices in a small bowl and mix well. This dish looks incredible! You have one lucky boy. Enjoy your precious year and a half. I hope you don’t mind…I’m passing this recipe on to my friends. Thank you! Please share the blog and recipes freely! I will. Especially a dish that looks like that in 30 minutes. The moms are all about fast and easy. So happy to find a new recipe this morning ! I have missed the beautiful blog that is filled with inspiration and wonderful food ! Made my day ! Looking forward to many more ! Thank you Kathy! It feels good to be writing again. A lot has happened over the last year so there is plenty to keep my busy and writing for a while! Trust me. They never stop coming home for food…and love. I can’t tell you how much I think of you and the relationship you have with your kids. You are and always have been a parental inspiration. Thanks Jodee! Previous post: So what happened to Feeding Andrew?